How can you maintain the best possible oral hygiene? Simple. Regular visits to the dental team at Shine Dentists and brushing and flossing combine for a powerful tool for the early detection of decay, damage, oral cancer and gum disease. We usually recommend bi-yearly visits, though those with weakened immunity or gum disease may need to be seen more often. X-rays are usually taken about every 2-3 years unless a new problem warrants a look inside of your teeth. 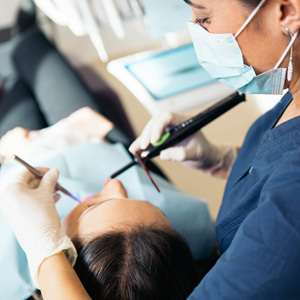 If further work is needed, you and your dentist will work together to create a treatment plan and all expenses involved, and you can then book those appointments. If needed, we’ll refer you to a specialist for treatment. Schedule your visit with our gentle, experienced team today! We have early and late appointment hours available.